When I was about fifteen years old, my grandmother stayed with us for a week while my mom was away. It was during that week that I was exposed to the power of freshly made bread. The aroma wafted through the air and tapped me on the shoulder and just like the cartoons, I floated through the air to the kitchen to find out what was baking in the oven. The following day at lunch I would remove dense slices of homemade bread and sticky cinnamon rolls from my brown paper bag and all around me typical teen favorites--bagged chips and chocolaty candy bars--were cast aside as everyone clamored for a bite of this rare food. I fell in love with homemade bread. Now with both Justin and myself in our thirties, with corporate jobs, commutes, and a mortgage, we’re not baking bread every night. Sometimes on these hectic weeknights, we are struggling to get dinner on the table! 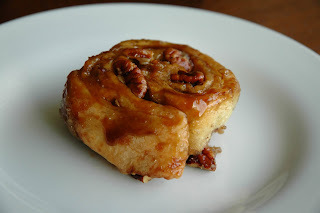 So when I found this clever recipe that allows us to easily make both pizza dough and sticky buns from one batch of dough, I couldn’t wait to try it. 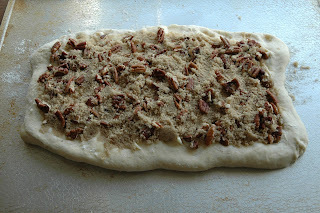 Perfect for the weekend, we started on a Saturday night and made two pounds of dough. 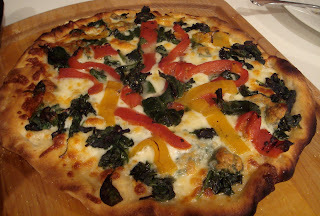 Using only flour, water, salt and yeast and minimal kneading, this dough was pretty darn easy. 1. Measure 1 and 1/2 cups of warm water (not hot) into a bowl and add 2 packets of dry yeast (1/4 oz each). Let sit for 5 minutes until foamy. 2. Whisk 2 Tbsp sugar, 1/4 cup olive oil, and 2 tsp coarse salt into yeast mixture. Be sure to use coarse salt or a little less fine salt as the larger crystals will affect the measurement and resulting saltiness. Add 4 cups of flour and stir into a sticky dough. 3. Place in an oiled bowl and loosely cover. Let rise in a warm place for about an hour or until doubled. 4. Using a floured cutting board, turn out dough and lightly knead. Add extra flour as needed to decrease stickiness. Makes about 2 lbs. It had one basic rise which made it even quicker. After the rise, we split it into two batches- on that went into the fridge for sticky buns the following day and one that would transform into pizza for dinner tonight. 1. Roll the dough and form the crust, using polenta or cornmeal on the cookie sheet or peel to keep the dough from sticking. We usually make multiple smaller pizzas that can be shared. This way, we can experiment with the ingredients. We made 2 medium pizzas that were more than enough from this 1/2 batch which was about 1lb of dough. Remember we saved the other half or 1 lb for the sticky buns. 3. Layer your ingredients: we often grate some mozzarella, and layer roasted red peppers, goat cheese, black olives, prosciutto, and fresh basil. Sometimes we saute spinach and onions and add those as well. If we want a touch of tomato that often comes from sauce, we use canned tomatoes that mimic that cooked tomato flavor. If fresh tomatoes are in season, we’ll use those too. This week we didn’t use any tomato. 4. Slide the pizza into your oven or on your preheated pizza stone.We baked ours at 450 degrees F and started checking at about 9 minutes, adding additional time if the dough wasn't browned. And the result was delicious--a delightfully complex yet discreet layering of flavors that you can taste. 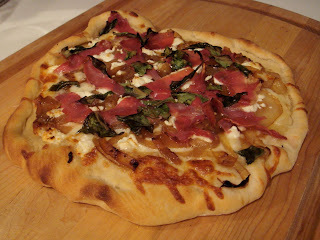 From the fresh flavor, clean flavor of the crust to the spicy herbal basil notes to the crispy savory prosciutto. Every note was lovely and harmonious. But don’t forget this is the dough that keeps on giving. The following Sunday morning with a generous amount of butter, brown sugar and pecans, this dough reinvented itself into sticky buns. “Be not afraid of butter” is the mantra for this second round of homebaked goodness. The dough was rolled out into a sheet, dotted with a 1/2 cup of butter and folded into thirds on itself. Fold the top third down and the bottom third up like a letter. After chilling in the fridge for an hour, it was again slathering with more butter and sprinkled with about 1/2 cup of brown sugar and about 3/4 cup of chopped pecans. Rolled into a jelly roll and sliced, the 12-13 rolls went into a greased pan and baked at 350 degrees F for about 30-40 minutes. Once turned out, the caramelized sugars on the now top of the buns, glistened and beckoned, “Eat me.” A word of advice, restraint is key was the molten butter and sugar will surely burn your mouth and taste much better when it isn’t piping hot! But don’t wait too long--these rolls have a short plate life and should be eaten warm. And that was our decadent but rather easy weekend of baked bread. We highly recommend it. So funny you posted this tonight! I hosted a make your own pizza party for my sister's birthday tonight. 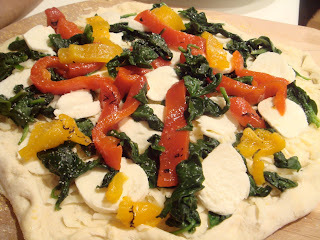 I used your pizza dough recipe and people brought their favorite ingredients. Pizzas were delicious, but unfortunately no left over dough for sticky buns. I second the little to no sauce comment. I'm pretty much done with tomato based sauces but like a little pesto every now and then. Thanks for sharing! I perfect remedy for missing the US! Thanks!!! Ugh - I only have 1 cup of flour left in the house - you're torturing me! 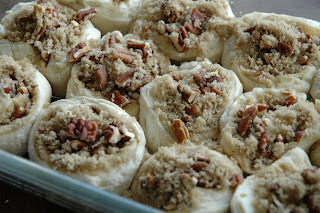 Those sticky buns just might convince me to do something I never do--bake. They look fabulous! and fabulous they were... yum. I love having neighbors who can cook such yummy food. Glad the dough recipe worked well! 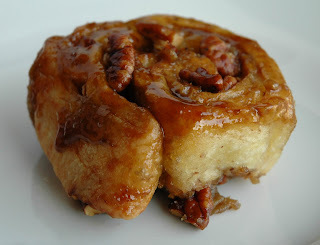 That was the first time I have made sticky buns and they didn't disappoint. You don't really see the sticky beauty until you turn them out of the pan. I hope you try them! Two of my favorite things all from one recipe! I can't wait to try them! oh yum. i love versatile and fridge dough recipes. you two should review the healthy bread in five minutes a day and artisan bread in five minutes a day books.